There are photographs from the early nineteen hundreds of salmon caught in the Columbia River weighing over sixty pounds an nearly as long as a man is tall. They are gone. Arguments about the few survivors abound. Some writers are referring to the million dollar fish due to the amount of money being spent with so little effect. The Bonneville Power Administration, the Federal power marketing agency for the Pacific Northwest, has spent more money on fish restoration projects than any other governmental agency. Many prefer to blame the many dams on the river as they are the most visible blockades to fish passage. It is obvious that some thought was given to fish passage at the time the dams were constructed as fish ladders were provided. A little closer inspection reveals that only a little thought was given. The fish ladders provide passage upstream but little thought was given to downstream passage. The design of the fish ladders, in retrospect, appears to have been initially designed more as a tourist attraction than to really help the fish. There were those who warned about this problem at the time but little was done until the fish were on the brink of extinction. When governmental agencies finally began to respond to the problem it was discovered how little was known about the fish. Also, when one does do something to restore, it takes about five years before one knows what effect one has had. Salmon are born in quiet streams that feed the rivers. They travel down the river to the ocean and it will be several years before they return to spawn and die. A large number of theories appeared as to what was the best course to follow but little hard data existed. Some wanted to tear down the dams which were blamed for the decimation of fish stocks. As was pointed out, rivers that had no dams at all still had devastated fish populations as well as those that had dams. Typically, political solutions consist mostly of unsubstantiated opinions. The real answers are far more complex. Loggers and farmers had destroyed the spawning beds. Loggers destroyed the stream side vegetation, and drove equipment through the streams. Farmers permitted cattle herds’ access to the streams directly, and fertilizer and pesticides run off into the streams. The large reservoirs behind dams served as an excellent environment for the growth of predators picking off the salmon as they came down the river. Some rivers had so much water withdrawn from them for agriculture that they occasionally ran dry. The tail race of dams, if not controlled, include enough dissolved nitrogen that the fish can be killed by a disease similar to the bends suffered by divers who dive too deep. If reservoirs are allowed to rise and fall by too large an amount, stream side vegetation does not develop so that it is possible for the fish to starve to death on their way to the ocean. Fish that go through the turbines do not fair well. 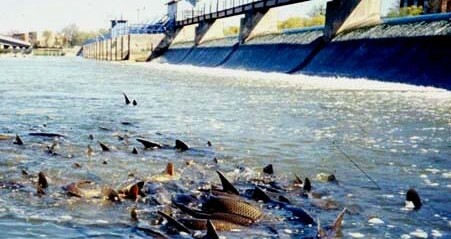 A percentage of fish are killed by passage at each dam. Fish that do survive the return trip can get lost in irrigation canals so these require fish screens. If the design is improper or they are not properly maintained they serve to kill fish as well as save them. To avoid the hazards of the down stream trip the salmon are rounded up and barged past the dams. Some farmers, once they understood the problem, acted to try to rectify the situation. Some loggers likewise tried to cure some of the damage that had been done. Others simply regarded the whole problem as a threat to their bottom line, financing political campaigns to silence those complaining about the destruction of another species. Hatcheries had been designed mostly to provide fish for sport and commercial fishermen. It was discovered that the hatchery fish were displacing the native fish by the sheer numbers produced. But the hatchery fish were not anywhere near as well adapted to their environment as the native fish and the lack of genetic diversity made them vulnerable to disease. Not only did new hatcheries have to be designed and built but a whole new method of supplementing the native runs had to be constructed. The fish problem in the Pacific Northwest illustrates the price system approach to physical problems. The physical environment is regarded as a consumable resource rather than seeing human beings as a part of a continuous fabric of life on Earth. Little attention was paid to fish when the dams were built because people wanted power, flood control, and irrigation. There was money in that the fish were in the river at the time and available to all who wished to fish for them. The price of straightening out the problem was passed to the next generation. Had the problem been dealt with at the time, the cost in just about all terms would have been far less. It is money that determines decisions in a price system. Technological problems created by the installation of a new technology usually are the result of failing to consider consequences due to the fact that there is no money involved or the consequence has no political constituency. It is also worth mentioning that by delaying a solution much more money can be made trying to straighten it out later. The destruction of most of the world’s major fisheries continues unabated. Price system theory says that, as one resource becomes exhausted, others will rise to take their place. This may be true but as the resource becomes more scarce the price rises, making it a more lucrative target. Now policing becomes necessary. Watching this scenario unfold again and again only points to the dangerous stupidity of price system operation. The operation of price system warps the view of any problem. The physical consequences of any activity are considered only in the light of monetary gain. In a price system the order of consideration is, first, financial, second, political, last and definitely least, physical. The installation of a Technocracy would not simply reverse this order; it would eliminate the first two. Human survival would be moved to the top of the list. The implications of technological installations could be examined without the interferences inherent in price system operation. Technology could be optimized for human benefit rather than devastating the planet for a paper symbol.